It made me start thinking of the whole bullying issue (stay with me here). Bullying is the key hot topic right now and of course it is hurtful and bad but are we tackling it the right way by saying, “don’t bully – it’s mean?” Deep down doesn’t the big fat meany bully already know he is being mean? Unless he is truly mentally unstable (which I suppose is possible) this should come as no big surprise to the bully. “Oh wait. This is mean? I’m just doing this due to my insecurity and need for external validation from my peers? Well good thing you told me. I’ll stop now.” Give these kids some credit won’t you? There is a PSA type TV commercial that is running right now that is making me crazy. Granted bad commercials in general chap my hide but this one is both bad and treats it’s viewer like he is stupid. Horrible combination. It has some girl getting practically thrown on the ground and kicked Jet Lee style in the school hall by the lockers (what school has lockers anymore) while others ignore the abuse. Come on. Seriously? Besides isn’t childhood bullying usually more emotional in nature especially among girls? The level of beat down this kid is taking while others just pass by is ridiculous. Instead of going negative with our message why don’t we turn it positive? Give praise and awards for being nice and doing good deeds. Kids aren’t stupid (most of them anyway). Why are we treating them like they are. I love following blogs and such of people trying to pass out messages of happiness and strength. This isn’t new (I never watched Oprah but this is very Oprah-esk) but it seems to be catching on which is amazingly wonderful! If you follow @AnnCurry on Twitter or search the hashtag #26acts you will find a treasure trove of people reaching out and being kind. (More info on how and why Ann Curry started this viral push toward niceness – http://www.cbsnews.com/8301-205_162-57560308/ann-curry-proposes-26acts-of-kindness-goes-viral/) You can’t read through very many before you start crying and believing that humanity is indeed good (unless you have no soul or are a bad witch). Now, as promised, more on Operation Beautiful (http://www.operationbeautiful.com/). Per the web site – “The goal of the Operation Beautiful website is to end negative self-talk or “Fat Talk.” If this little blog only does one productive thing, I hope it helps readers realize how truly toxic negative self-talk is — it hurts you emotionally, spiritually, and physically.” To participate you grab a sticky note pad and a pen and write out positive messages to strangers then leave them in places they will be found. The woman who started this movement, Caitlin Boyle, is adorable. Truthfully I don’t follow her Operation Beautiful blog but I do read her personal blog (http://www.healthytippingpoint.com/). Caitlin also goes around the US conducting inspirational discussions with teenagers within high schools spreading her message that everyone is beautiful. Although aimed toward teens, who are often at the age where you struggle with your self-identity and care deeply about what others think, I’m all for getting the message out to adults as well. Seriously, if I was on a date and, feeling self-conscious, popped into the restroom to “freshen up” (aka try to slather on more make up in an attempt to look alluring) and came across a post-it staring at me telling me I was already beautiful it would be a game changer. I’d drop my make-up bag back into my purse, stand up a little straighter, smile at myself in the mirror and pronounce, “That’s right! F*** it. Let’s go do this thing Post-It” and then proudly head back to my date with more self-esteem than before. 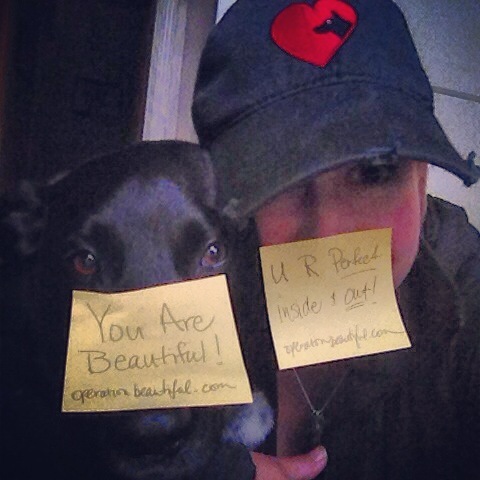 I’d love it if more people around the world became a part of Operation Beautiful. It’s so easy and can lead to such happiness. There is another duo of woman specifically crusading against the negative, harmful, and untruthful messages about the ideal beauty as portrayed by the media. They have started “Beauty Redefined” (http://www.beautyredefined.net/). Much like Caitlin the founders, Lindsay and Lexie Kite, are inspirational speakers and spread their message through presentations along with Facebook and Twitter. They actually sell pre-printed post-it notes through their site, with messages that are designed to spread ideas of positive self-image and knock down any media that is helping spread visual lies. I really like two parts of Beauty Redefined. First of all they have an entire photo album on Facebook dedicated to real, un-photoshopped women who are proud of who they are (http://www.facebook.com/media/set/?set=a.426191410745343.98353.193209467376873&type=3). They also have an eye-opening gallery of photoshopped pictures of celebrities that is just fascinating (http://www.beautyredefined.net/photoshop-phoniness-hall-of-shame/). These pictures are supposed to show us that even those gorgeous models and actors on the cover of that magazine aren’t that skinny and perfect looking in reality. You know what it shows me???? It shows me with a little better lighting, a snazzy make-up artist, and a buttload of computer wizardry I too could be a super model! That just makes me happy!!!! Happy Friday and remember you are beautiful (no matter what any asshat may say to you)!